Thanks to all those who responded to the last Langstaff Letter ‘Nebuchadnezzar and Obama.’ I want to follow up a thought from that letter regarding ‘American Exceptionalism.’ In recent times, there has been a debate about whether we have been or are still intended to be an ‘exceptional’ nation. Some have felt that President Obama’s actions and language reveal he is against American exceptionalism, making the USA just one power among other developed nations. Let’s look at this issue. We have confused the concepts of “exceptionalism” with “elitism”. By that I mean, we are exceptional because we have resources and lifestyle that people in most other places on the earth cannot begin to comprehend. I believe with all my heart this is because we were founded on Godly principles (even though some would point to slavery and segregation to counter that premise). We become elitist when we believe we are entitled to this lifestyle and position in the world and that it alone makes us better than every other nation. In other words, we have wandered away from the Godly foundations and are wondering why the building is collapsing – and why God isn’t doing anything to protect or restore it! Exceptionalism should never become elitism. A nation, like individuals, ceases to be humble when it fails to recognize it was God’s doing in making America great. 1. Exceptional Formation – I believe that in spite of how some have sought to rewrite history, America had a destiny, as God had a plan and a purpose for this nation ‘to be a city set on a hill.’ I know when we first moved to live in America in 1980, we came across the book ‘The Light and the Glory’ by Peter Marshall Jr and David Manuel. Growing up in Australia, I really did not know a lot about America’s Christian heritage, going back five hundred years. It was an eye opener for us to realize that built into history was a sense of a God given destiny; that God had a plan for this country and that He intervened repeatedly to ensure that it had a chance of coming to pass. I could not help but see a contrast with Australia, the nation where I was born, that began as a convict settlement in 1788. I often joke that America caused it to be so. After the war of independence, Britain had nowhere to send its prisoners and outcasts, which had previously been sent to America, so they established a convict colony and for the first hundred years, the majority of the inhabitants of Australia were convicts or the descendants of convicts. What a difference in the way each of these countries were born. America is exceptional because of the way it was formed. It had a God given destiny. Now as quoted earlier, there are blemishes in our nation’s history, including slavery and segregation. Also the issue of the Native American Indians, the original inhabitants of this great land. Much has been done to seek to rectify these matters – e.g. through ‘identification repentance.’ But the history of the world is one of conquests and it is hard to find places where these kinds of things didn’t happen. Back in my original homeland Australia, the Aborigines were the original inhabitants and in the island state of Tasmania off the southern coast of Australia, every one of them was wiped out. History is a record of man’s inhumanity to man but in the midst of it all, God still works out His purposes and plans. 2. Exceptional Blessing – America has been blessed like few other nations. Part of this grew out of the exceptional form of government that was built into our constitution that has survived over 200 years, coupled with a free enterprise system that has encouraged people to work hard in many fields of endeavor. As noted above ‘we have resources and a lifestyle that people in other places on earth cannot begin to comprehend.’ God has blessed this nation with an abundance of good things. 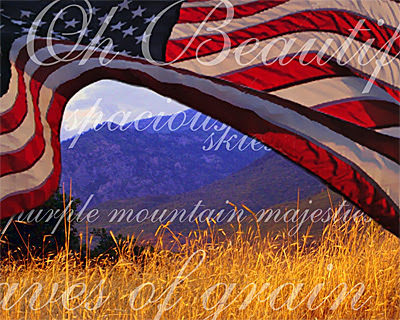 It truly is America the beautiful. I remember on one of my early trips to America, before we moved here, going to Disney World in California and seeing a movie presentation, in a theater in the round, of America the Beautiful and sensing what a wonderful nation this was. A nation blessed of God. 3. Exceptional Attitude – America, as a world power, has been different to other nations or empires. It has never sought colonies and the only land beyond its borders that it desired was a place to bury its dead from times of war, like in Normandy, France. Most conquering nations have sought to retain the land they fought over. Not so with America. America, because of its great power, is the only true free country that can come to the aid of others, such as how it came to join the battle against Nazi Germany but did not stay to occupy it. I am an American citizen, but I grew up in Australia during the time around the Second World War. One of my earliest memories is being sent home from school as a naval fleet was approaching Sydney harbor and it was thought that the Japanese were coming to attack Australia’s largest city. It turned out to be the American fleet and all was well. However, the point I want to make is that Australia would have fallen into the enemies hands, as at that time we were only a small population in a large land (maybe 10 million or so), without America coming to our help, it is highly unlikely we could have defended ourselves. That is why Australia has a debt of gratitude to America and has stood with the USA in all the wars ever since, including Vietnam. America gave ‘exceptional’ help in a time of crisis, when no other nation could have done it. America is an exceptional (not an elitist) nation because of those three things, but in spite of them it is in danger today. Why? Because nations and empires usually disintegrate from the inside, not from the outside. It happened with Israel, when Israel turned it’s back on God. So, despite it’s heritage, it’s destiny in God, America is in danger today because as a nation we have turned our back on God, particularly going back to the 1960’s where ‘prayer’ was taken out of schools and the 1970’s when ‘abortion’ was legalized and now at this present time when ‘gay marriage’ is being legalized. However, as I constantly declare Isaiah 60:1-2 is the picture of the world today. In the midst of the darkness, God’s glory will fall on a remnant of His people and in turn God will bring a mighty revival to this nation once more. Let us pray for that to happen soon, so that America, once again, will be an ‘exceptional nation.’ God bless America, once more!